With these gloomy days of winter upon me, it’s all I can do to avoid plunging face-down into a carbohydrate-fueled funk every day. Here’s a little gem I found last summer in SonWon’s shorts pocket and just rediscovered among my papers this week. 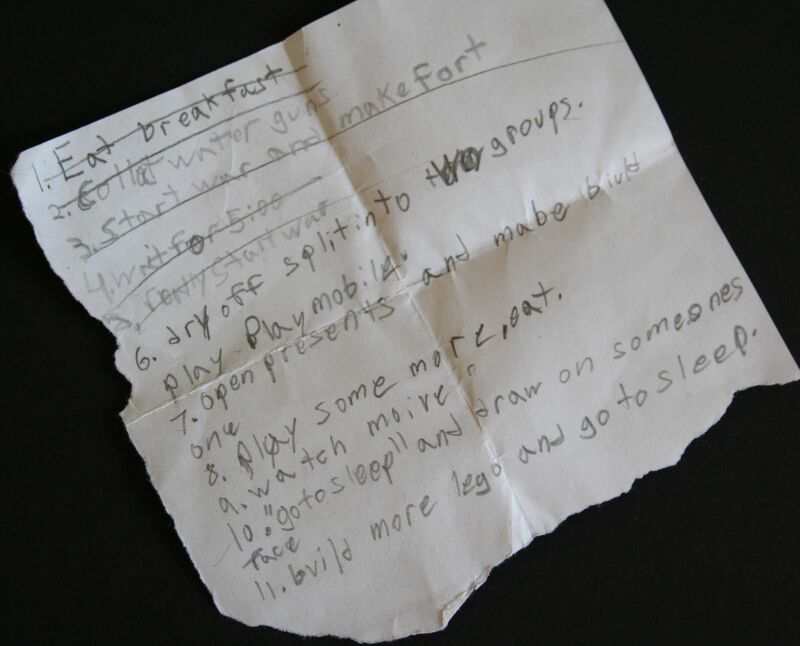 It was a to-do list he had made for his 10th birthday last July. Against all sense, we agreed to host a party and sleepover of seven boys, and G-man – normally as structured as a weed garden – decided it was monumental enough an event to actually plan out. It’s a bit herky-jerky, with some group activities scheduled to begin before the 5:00 guest arrival time, but c’est la vie when you’re turning 10. Though his spelling and penmanship hint strongly at “short bus,” I’m happy to say that the boy attends an honors school, which – thank god – recognizes other characteristics. 6. dry off split into two groups. play Playmobile. 8. Play some more, eat. Would that we could all have that day.